MATTHEW 17:20 KJV "And Jesus said unto them, Because of your unbelief: for verily I say unto you, If ye have faith as a..."
17Then Jesus answered and said, O faithless and perverse generation, how long shall I be with you? how long shall I suffer you? bring him hither to me. 18And Jesus rebuked the devil; and he departed out of him: and the child was cured from that very hour. 19Then came the disciples to Jesus apart, and said, Why could not we cast him out? 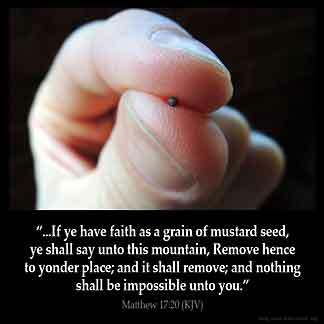 20And Jesus said unto them, Because of your unbelief: for verily I say unto you, If ye have faith as a grain of mustard seed, ye shall say unto this mountain, Remove hence to yonder place; and it shall remove; and nothing shall be impossible unto you. 21Howbeit this kind goeth not out but by prayer and fasting. 22And while they abode in Galilee, Jesus said unto them, The Son of man shall be betrayed into the hands of men: 23And they shall kill him, and the third day he shall be raised again. And they were exceeding sorry. And Iesus said vnto them, Because of your vnbeliefe: for verily I say vnto you, If yee haue faith as a graine of mustard seed, yee shall say vnto this mountaine; Remoue hence to yonder place: and it shall remoue, and nothing shall be vnpossible vnto you. And He *said to them, "Because of the littleness of your faith; for truly I say to you, if you have faith the size of a mustard seed, you will say to this mountain, 'Move from here to there,' and it will move; and nothing will be impossible to you. And he says to them, Because of your little faith: for truly I say to you, If you have faith as a grain of mustard seed, you will say to this mountain, Be moved from this place to that; and it will be moved; and nothing will be impossible to you. And Jesus said to them, Because of your unbelief: for verily I say to you, If ye have faith as a grain of mustard-seed, ye shall say to this mountain, Remove hence to yonder place, and it shall remove; and nothing shall be impossible to you. Because your faith is so small, He replied; "for I solemnly declare to you that if you have faith like a mustard-seed, you shall say to this mountain, `Remove from this place to that,' and it will remove; and nothing shall be impossible to you. He said to them, "Because of your unbelief. For most certainly I tell you, if you have faith as a grain of mustard seed, you will tell this mountain, 'Move from here to there,' and it will move; and nothing will be impossible for you. but this kynde is not caste out, but bi preiyng and fastyng. 17:20 Because of your unbelief - Because in this particular they had not faith. If ye have faith as a grain of mustard seed - That is, the least measure of it. But it is certain, the faith which is here spoken of does not always imply saving faith. Many have had it who thereby cast out devils, and yet will at last have their portion with them. It is only a supernatural persuasion given a man, that God will work thus by him at that hour. Now, though I have all this faith so as to remove mountains, yet if I have not the faith which worketh by love, I am nothing. To remove mountains was a proverbial phrase among the Jews, and is still retained in their writings, to express a thing which is very difficult, and to appearance impossible. #Matt 21:21|; Luke 17:6. Mt 17:20 This mountain. Lofty Hermon, in plain sight. Nothing shall be impossible unto you. Upon the condition of perfect faith. Compare Heb 11:1-40. Faith in Christ, faith exercised in fasting and prayer, are the conditions of power. We need faith to overcome mountainlike obstacles that interfere with our spiritual progress and to cope with difficulties. We should always work on strengthening our faith in Jehovah God and his promises. Faith as a mustard seed,the little faith must be put to action, and its gonna grow, if we have a huge faith as a mountain and not put it in action its as gud as nothing.so that little faith we have lets put it to use and it will produce remarkble results. Faith is the substance of things hope for and evidence of things not seen. Areas where we need faith can be grouped into Physical and spiritual.For somebody to do exploit in life, he needs faith. For somebody to perform miracles, set the captive free, conduct deliverance service s , receive his healing, even praying to God, he needs faith. For somebody to make it to the end, he needs faith. That is the reason why bible says without faith, it is impossible to please God. Faith is the substance of things hoped fir and evidence of things not seen.I believe by all uncureble illnesses can be cired.